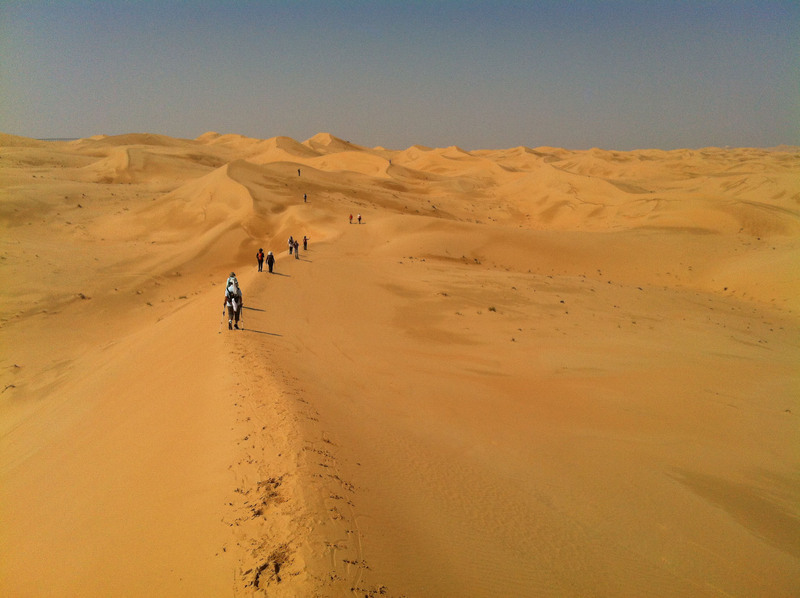 Many years ago, the women of Abu Dhabi used to walk (yes, walk…) all the way from the humid coast to the drier inland climate of Al Ain with their children. They found the heat more bearable in this oasis town, (which is relative since last summer many days reached 45 degrees celsius here in Al Ain…) so they left their husbands behind for pearl diving season, and set out trekking across the desert. Today there is an annual event, following the footsteps of these women, walking the return journey from Al Ain to Abu Dhabi. 120 kilometres in 5 days. Sleeping in Bedouin camps by night and walking and talking with women from all over the world by day. All this to honour the strength and endurance of Emirati women. The first day I heard about this event, I knew I wanted to do it. 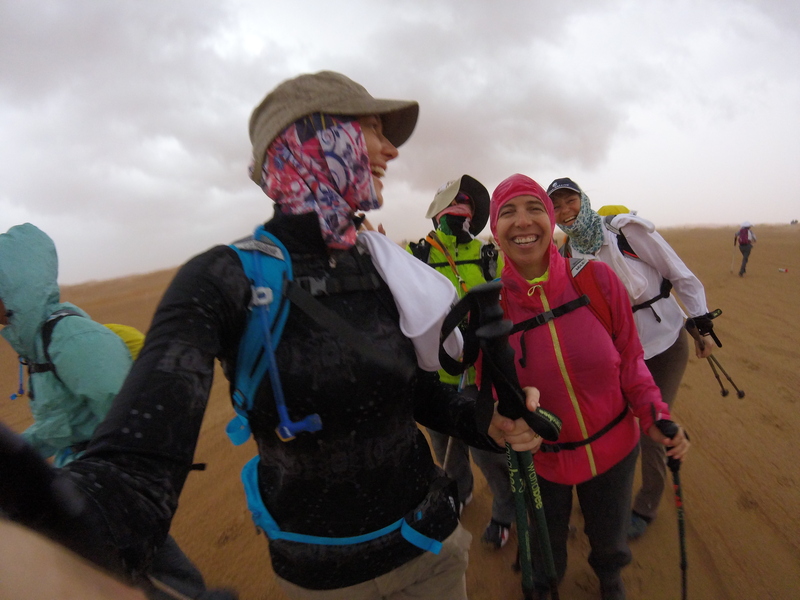 In October I signed up, and with two Al Ain friends, began training, building up our walking endurance so we could eventually handle 25 kilometres a day in the sand. In hindsight, the training times ended up being one of the most amazing parts of this experience. Besides developing the discipline to walk 6 days a week, for longer distances than I’d ever covered before, the relationships that were built by this kind of time together become very precious. Walking for hours at a time on a regular basis with thoughtful and diverse women is possibly the best gift I received all year. I have been encouraged, challenged, and inspired by how they view life and their experiences. I honestly could have called it quits after the training period and still have walked away so much richer, without even needing to participate in the walk. But, of course, I didn’t call it quits. March 7th arrived, and all 40+ women gathered at a resort in Al Ain for a meal together and to prepare for our departure the following morning. We knew the forecast was calling for rain, but desert rain is fairly unpredictable, often isolated, and rarely lasts long. (ominous foreboding…) We left the resort at 6am on the morning of March 8th, and had a perfect start. When we stopped for lunch at 12:30, it was obvious there was a storm coming our way, so we cut our break short, and decided to walk as far as we could before the rain came. And it came. Not just rain, but thunder and lightning and wind. In fact, the storm didn’t abate all that day, or the next, and it turns out, it was one of the most intense storms Abu Dhabi has seen in over 30 years. And it just happened to hit on days one and two of our walk. We finished our route for day one, and made it to camp soaking wet, and in remarkably high spirits, what with the adrenaline rush of avoiding the lightning strikes, and all. Unfortunately, our camp did not fare as well as we did- it was partly leveled from the wind and everything was drenched from the sideways rain. 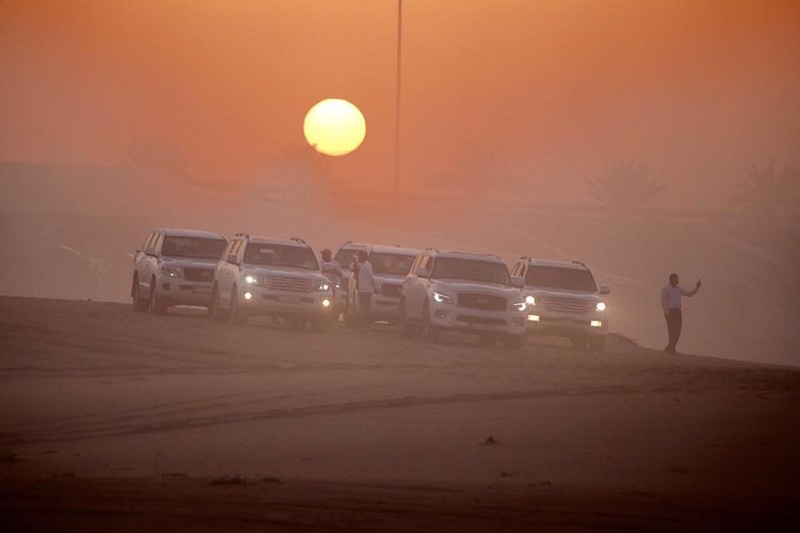 As we could obviously not salvage the camp, the decision was made to shuttle us out of the desert on our modern day camels – Toyota Land Cruisers – and back to the resort in Al Ain. The plan was to dry everything out, get a good night’s sleep, return to this spot the next morning, and resume our walk. We’d lose out on one night in the desert, but we’d have a story to tell, and we’d be back on our journey in no time. Unfortunately, it become clear that evening that the storm was going to be much worse the next day, which it did indeed turn out to be. There was plenty of video footage online of the havoc the storm wreaked on Abu Dhabi, and seeing the size of the hail stones out in the region of our walk, I know it was best that we were held back and not allowed to walk on day two. However, to make a long story short, we were also not able to walk on day three, and while we were eventually shuttled back out in our Land Cruiser camels to resume our walk on day four, there was a lot of emotional battle to endure in between. It was not easy to accept the fact that we would be unable to achieve our goal of five consecutive days walking 120 km straight. We lost out on campfires and nights under the stars and some of the unique experiences that had been planned for us each evening. We lost out on the simple accomplishment of walking out the door in Al Ain and arriving by foot in Abu Dhabi. It was something we had been training for and dreaming of for four months, and it simply wasn’t going to happen. There was nothing we could do about it. And therein laid the greatest lesson I had to learn from this walk. A lesson I thought I had already learned. Some things in life are beyond our control. But more than that simple truth, the bigger insight for me was to see who I am when life unfolds unexpectedly. I am not someone who easily lets go of something I really want. And I felt this achievement was being wrestled away from me, very much against my will, and the bottom line is, I felt very sad and very disappointed. I was obviously not alone in that. Each woman felt her own level of sadness and disappointment and dealt with it in different ways. It was an emotionally volatile couple of days while we waited out a storm that we couldn’t control. But I was so humbled by the reactions of many women around me. So many responded with dignity. With peace and acceptance that led to joy. I was especially challenged by the Emirati women in the group, who admittedly, seem to handle the unexpected in life a lot better than goal-driven Westerners like me. They simply reminded me that this was how it was meant to be. The rain was going to come and our plans were going to be changed, and that’s just how it is. Our experience of the walk was to be shaped by this storm. What I wish I’d recognized sooner in those couple of days was that us women were still together. We were still honouring the strength and perseverance of Emirati woman who had surely endured their own life storms and adapted. We still had opportunity to support each other and stay strong, if not through the sand and under the scorching sun, then at the table, waiting out the rain. Thankfully I caught this lesson from the women around me. I wish I could have been the first to respond with such grace, but even at 40 years old, I still have a lot to learn. I hope when the next unexpected life event unfolds I will be even quicker to respond with grace, acceptance, and joy. We did have one beautiful night together under the stars in the desert, and we ended up covering almost 100 kilometres of the heritage trek. On day four alone, we walked almost 40 kilometres. Almost 30 on the final day. The whole event was still an accomplishment, and for me, a series of outstanding lessons and memories which I know I’ll treasure more than the missing 20 kilometres. This entry was posted in Processing Life and tagged whw_uae, Women's Heritage Walk UAE.